Light! I need more light! Lucy is great, she has multiple LEDs, but as I expected it isn't quite enough light as I prefer when I'm sewing. I want my sewing area lit up like a ??????? During the day and especially in the afternoon, the sun streaming in the window from the south is awesome but because of shadows I typically turn on my supplemental lights. This is my current set up. I didn't alter this photo at all so that you could see what it typically looks like. It was taken around 9am; today it is raining and dreery so it is very overcast and dark outside. On sunny days it is much better. I have 2 Ott lights aimed at my extension table, on in the front and one in the back. But it is a pain in the arse to have that lamp just to my right. And the one at the back doesn't bog me down but this isn't the ideal situation. I want them gone and something else instead that will do the job but be well out of the way. Before Lucy actually got unpacked and set up, I had emailed a bit back and forth with Kelly from I Have a Notion. I remembered her review of a clamp lamp from a while back but couldn't remember the name of the product. 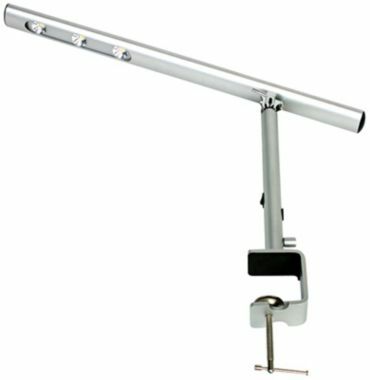 It turns out that it was the LUX Bar Clamp light by Mighty Bright. I am very interested in this light. It sounds awesome. But Kelly actually suggested that I start with a Bendable Bright Light instead. Now the problem is that I can't decide which one to get or get both. I want more light at the needle sure but I also want more light on the overall table. Would the bar light be enough for both areas? So what are your thoughts? Do you have one or both of these lights? Based on what you see in my set up picture, which one (s) do you think would work best for me? My birthday is coming soon an my mom asked what I would like. She always gets me something that I really want. The problem is that I can't decide exactly WHAT I want. Help please! Here is my two cent worth. I have the mini light and yes it is spot on but when you look up or around it is still dark. I do not use it any more and now use an ott light. I agree with rachel the more light the better for me. Good luck with your choice. 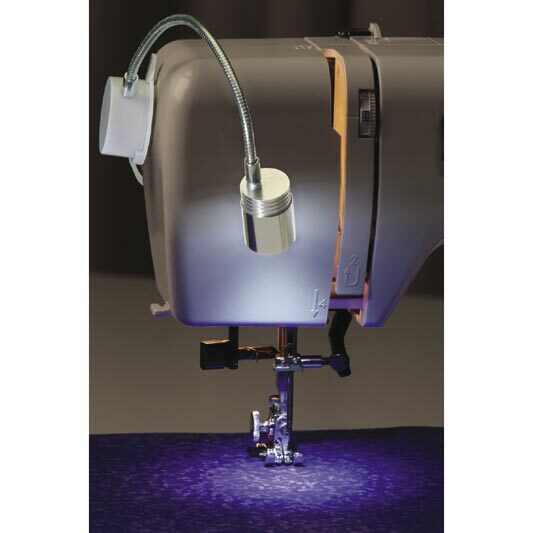 I have the little bending light, but my best buy was just a hardware store buy = $1 sale - a clamp on light with long cord and I bought the Ott light bulb at Harbor Freight for under $8 - When you buy from quilting stores, you pay top dollar. Get an adjustable and buy the Ott bulb thru hardware. Michele, your machine looks great, all set up and waiting for you! I just use a clamp-on light on a shelf above my machine and it works like a charm. But I do like Sharon's idea...I didn't know you could purchase an Ott light bulb...will have to check around for this. Good luck! I would go with the one that gives the most light to your whole area. I don't have either of these lights but they look good! I used to have my machine in front of the window but it seemed to cause too much reflection, I now sit with the window to my left side and many times close the blind but my husband installed several natural light florescent lights which really works well. My Big Goal? Sewing Summit 2013! Indecision? Go with Plan D?